It’s been a while coming for Jordan Wilson and Ben Riley – the duo also known as Georgia Fair. Their debut album – All Through Winter – is due for release on the 21st of October, and it’s fair to say there’s been a few people waiting on it. Touring with The Panics, the band have been showing off their new work recently, but how does it sound recorded? Starting with the slow-burning “Times Fly”, the album kicks off with a strong start. “Blind” brings out intense, rolling drums, and “Where You Been?” is the perfect first single from the release. Georgia Fair weave these beautiful vocal harmonies into folk music that goes beyond the whole cutesy idea of finger-picking some guitar chords. With lush strings and deep guitar, the songs sound mature and layered. It’s a much fuller sound, and it’s all the more interesting because of it. The best bit: the production is beautiful and sounds just as it should. What it lacks for the most part, are stand out hooks. All Through Winter is rewarding when it has your attention, but rarely does the album grab it naturally. “Blind” and “Simple Man” both seem to take it up a notch, and so do a couple of others, but nothing really jumps out. Aside from that, too often do Wilson’s vocals feel under-stated. He has an amazing voice, and when really pushed out during some choruses, it explodes, sounding stronger than ever. Unfortunately, too often it feels restrained. Maybe this album isn’t for me. When cherry-picking tracks for analysis, everything positive I’ve said stands – beautiful folk harmonies alongside a matured sense of song-writing – and it’s consistent in this sense too! But as an album, the release can’t sustain my interest. I feel I’d enjoy it more as an EP. Chances are, that’s more a reflection on my personal tastes. Whether or not you listen to this as an album or not, if you dig great melodic folk music, you should have a listen. 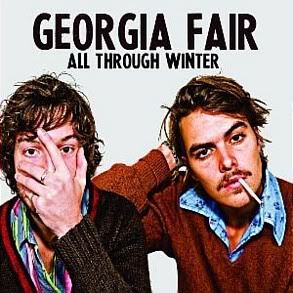 Georgia Fair have made leaps and bounds in many ways, and while I don’t think they’ve found their feet just yet, they’re getting pretty damn close.